This is not a cutaway illustration. It’s the Marzal, the most important Lamborghini that never was. The love child of 50 square feet of glass and half a Miura engine, it was the epitome of Lamborghini’s pre-supercar design philosophy. Last month, the only one made was sold for $2.1 million. That Lamborghini became a maker of brash, mid-engined, German supercars is a strange quirk of history. When Ferruccio Lamborghini launched his company, he intended it to be, in essence, the anti-Ferrari: a maker of very fast, but very comfortable cars, grand tourers as opposed to the race cars with license plates and headlights Enzo Ferrari was selling at the time. Then a skunk works group invented the modern supercar in the shape of the Miura, and the seeds of wild, outrageous, supercar-making Lamborghini were sown. You have to wonder what Ferruccio would make of, say, a Droptopleggera. The Marzal is the apotheosis of the original Lamborghini ethos. Designed by the same Marcello Gandini of Bertone who designed the Miura and the Countach, it was a dream of space, a dream of a clean and beautiful sci-fi future, a gullwing prototype with 50 square feet of glass and only half an engine. Like no Lamborghini ever made, the Marzal had a 2-liter straight-six, a single cylinder block from a Miura, all in the name of high speed travel in splendid comfort. The engine was mounted transversely in the rear to maximize interior space, a twist on the way Alec Issigonis approached the Mini. 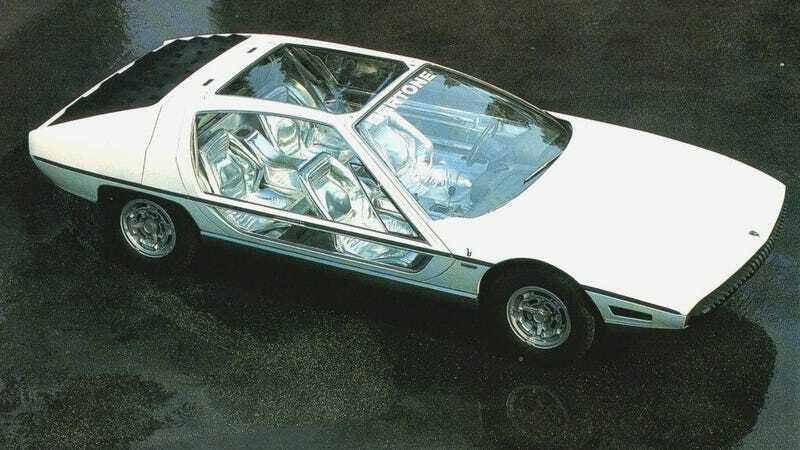 The interior was hexagons run wild, and it was surrounded on all sides by so much glass that when you stand next to the car, it feels more like a fleeting X-ray than a big Lamborghini. The production version spawned was called the Espada. I once had the good fortune to spend an afternoon in one, and even if it’s a more traditional car than the Marzal, it’s spacious enough that, at 6'2", I was very comfortable even in the rear, thinking of nothing but the wall of sound cast by the giant V12 up front. It would make a perfect car for a family of four. If you wish to spend an entire afternoon—or, for the sake of extravagance, an entire day, or, even better, several days—in one, you can have one for the fraction of the Marzal’s price: fine examples can be found in the $50,000–$75,000 range. Neither the Marzal nor the Espada will outcorner an Aventador, but it’s a sure way to become temporally removed shotgun buddies with Grace Kelly, who was driven around at the 1967 Monaco Grand Prix by his her husband Prince Rainier in the Marzal.